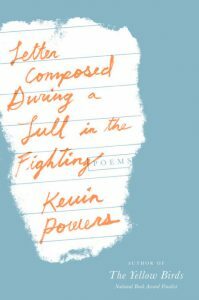 Kevin Powers is a poet who knows our country is blackout drunk on “making little pieces of metal pass through each other” (5). Because he has been to war and fired his machine gun at Iraqis in Mosul and Tal Afar, and lived to write about it, Powers’ book, full of hard questions and messy deaths, is part of a larger body of literature evoked by America’s war industry that illustrates the stupefying beauty of annihilation. And yet, Powers is not satisfied with articulating loss in order to gain sympathy for the newly dead or to lament the ceaseless procession of soldiers marching toward their graves. Make no mistake: War drums are not pounding in these poems, nor are these one-dimensional poems meant to somehow valorize America’s vast industry of exporting murder. Instead, readers hear the subtle lub-dub, lub-dub, of an arrhythmic heartbeat emanating from the senseless brutality of modern warfare. Powers’ work is evidence of the trauma that manifests after the shelling stops, when the world (as though recently embraced by king Midas) is left shining and dead. The line, “I am home and whole, so to speak” carries in those three simple words, so to speak, the promise of mutual destruction (23). The speaker has killed for his country so we do not call it murder, but the arbitrary (some would say nonsense or nonexistent) difference between such categories of destruction cannot be heard over the gunfire, and in the end death is death. At any rate, it is apparent in Powers’ work that a mind and heart inclined toward poetry is unable to compartmentalize in such a way. The result seems to be this: regardless of circumstances, every act of killing carries a toll to be paid by the killer, the only question is what happens when that toll accumulates beyond a person’s ability to pay it. As Powers writes, “what / is the calculus of change required / to find what’s lost if what’s lost is you” (41). had been quite loud. Think of how he still seems to scream. Think of not caring. Call this “relief” (38). Powers’ poems seem to say that, when trauma makes a home in our chest, the best we can do is face it honestly or label it something else, but either way the pain stays with us for the long haul. And yet, despite the debilitating effects of combat and all its reality-distorting manifestations, Powers manages to weave hope into his lines. A reader will likely get the sense that we are meaningless, insignificant flotsam, and yet Powers says, “I promise / someone will love you anyway” (p. 92). Maule is an MFA candidate at the Rainier Writing Workshop in Tacoma, Washington, the author of one book of poems, Dog Star (2015, Big Yes Press), the winner of the 2014 Academy of American Poets Contest at Cal Poly, SLO, and co-editor of Aperçus, an online literary magazine (www.apercuslitmag.com). His poetry has appeared in Byzantium, Badlands, and Askew, and he recently published a review of Reginald Dwayne Betts’ Bastards of the Reagan Era in Talking River, as well as a review of Adrian Matejka’s Map to the Stars in Rain Taxi.